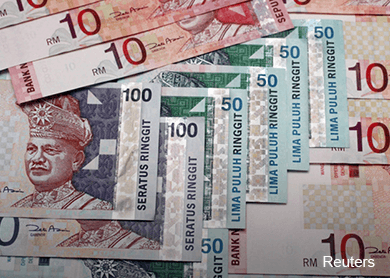 KUALA LUMPUR (July 7): The ringgit strengthened against the US dollar in afternoon trades, after weakening to a fresh intraday level at 3.8222 earlier today. At about 1.45pm, the ringgit strengthened to 3.8077 versus the US dollar, which has been seeing demand from investors amid Greece's debt crisis. This is because the US dollar is deemed a haven, amid market volatility. The US dollar index, which measures the currency's strength against a basket of major currencies, rose to 96.404, from 96.3 yesterday. In view of the US dollar's strength, economists and analysts said the ringgit still had room to depreciate against the US dollar. Hong Leong Investment Bank Bhd economist Sia Ket Ee said the ringgit was projected to reach 3.8600 against the US dollar in the third quarter of this year, before trading 3.7000 by year end. Sia said the ringgit's trading dynamics came against a confluence of global and domestic factors. The global factors include Greece's debt crisis and an expected US interest rate hike this year, while the domestic issues include "unsupportive Malaysian economic data releases and political glitches brought on by 1Malaysia Development Bhd," according to him. “There is still room for further depreciation in the near-term, because of all of these factors. “For the next few months, data releases pertaining to Malaysian economy will still point to unfavourable developments, because the released data for the second quarter will be affected by the GST (Goods and Services Tax) implementation,” Sia told theedgemarkets.com. Meanwhile, equity analysts warned it is possible for the ringgit to break above the RM4 mark against the US dollar, if Greece exits (Grexit) the euro zone. TA Securities Holdings Bhd's research head Kaladher Govindan said investors were spooked by the Greece debt crisis and would remain conservative in their financial decisions. Kaladher said Greece's debt crisis would result in capital flight to haven currencies, like the US dollar. “Ringgit is likely to remain weak until Greece gets a lifeline, as investors are rushing to safe haven currencies on Grexit fears. If Grexit really happens, RM can break above RM4, as foreign shareholding in equity and MGS (Malaysian Government Securities) markets are still high. "The 1Malaysia Development Bhd (1MDB) issues also add to the complexity and risk averseness for many investors," said Kaladher in an SMS reply to theedgemarkets.com.